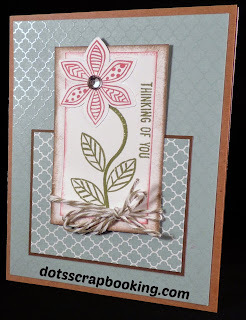 Dots Scrapbooking: Combined Challenges So Much Fun!! I've combined an Atlantic Hearts Sketch Challenge (Sketch #106) with a new color challenge from Color My Heart Color Dare. I do like these colors. I love light blue and brown together and pink and green together are just meant to be. So I started off with the Glacier (gorgeous color) and chocolate, which I love for other reasons ;-). Since I've started these challenges, I decided I really like our Paper Fundamentals, this is Glacier from the Whimsy pack. The shiny embossed-like surface, well it's shiny and I like shiny. The flip side is a print version in the particular and white in the same design. The stamp is Pretty Petals C1599. 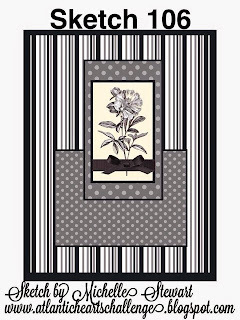 It uses the flowers from the Art Philosophy cartridge so you can stamp the image on a already cut flower. Yay!! The stem is straight but I wanted to curve it which is so easy with our acrylic stamps. I used the Olive stamp pad for the stem leaves and greeting. The flower is stamped in Hollyhock ink. The background of the card is kraft paper and the tiny edge around the horizontal rectangle is Chocolate cardstock. There are 2 pieces of white cardstock, one with the flower and greeting which I distressed in Hollyhock ink and the second is distressed in Chocolate ink. The Bakers twine is Olive and white. I love your curved stem, it really makes it look like the flower is growing off the page. I also like how you used both sides of the paper fundamentals. I love how you used both sides of the paper fundamentals. What a wonderful card! Thanks for joining us at Color My Heart Color Dare. I love this card, the paper fundamentals are awesome, I so need to get some, it has been on my wish list for a long time! Thanks for playing along with Atlantic Hearts Sketch Challenge (AHSC)! Wonderful interpretation of the AHSC sketch along with the Color My Heart Color Dare palette. I love your paper choice from the Paper Fundamentals set. Thank you for playing along with AHSC and the Color Dare this week. Great card! I love those paper fundamentals too... really extends every paperpack! This is really different and lovely! I love that you used the from and back of the paper fundamentals! Beautiful card! Thanks for playing along with Atlantic Hearts Sketch Challenge (AHSC)! Love how you have used both sides of the Fundamentals paper, what a pretty combo! Thanks for joining us at AHSC this week. What a beautiful card. Love all the distressing. 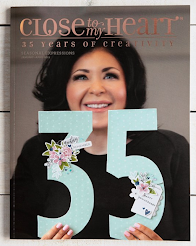 Thank you for inspiring us at Color My Heart Challenge Blog. Fabulous card! I love this stamp set but have yet to pull it out and use it. 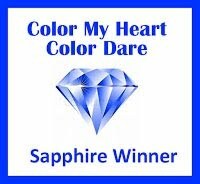 Thank you for the inspiration and thank you for playing with us this past week with Color My Heart Color Dare. Gorgeous! I love the subtlety of the colors. Thanks for playing at Color My Heart last week.